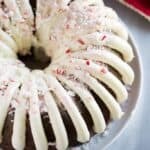 Moist and perfectly delicious Chocolate Peppermint Bundt Cake with cream cheese frosting is an easy Christmas dessert recipe that is sure to be a crowd pleaser! 1 box chocolate cake mix ** See note for homemade. (devils food cake or German chocolate cake mixes work well). Mix cake ingredients together with an electric mixer. Fold in chocolate chips. Pour into a well-greased bunt cake pan. Bake at 350 degrees F for 45-50mins or until toothpick inserted into the center comes out clean. Remove from oven. Allow to cool in the pan for 15-20mins. Remove from pan. At this point you can frost it and serve it, or you can wrap it in plastic wrap and let it sit overnight in the fridge before frosting. In a medium bowl, beat the cream cheese and butter until creamy. Mix in the vanilla. Gradually stir in the powdered sugar. Pipe onto cake. Sprinkle with crushed candy canes. *If you'd like to make the chocolate bundt cake from scratch, here's my favorite recipe.